Just over a month ago, it was the centenary of Tove Jansson's birth. There were public celebrations in her home land of Finland, and an exhibition at the Finnish National Gallery dedicated to the paintings, illustrations, and writing of this extraordinary figure. I haven't been to see it, but my cousin and fellow Moomin-fan Ann - who lives in Norway - has. She describes how "Tove and Tuulikki built the house using materials they found washed up on the beach. The roof tiles, by the way, were made from cedar bark they found and cut into shape using nail scissors. Fish-scale pattern. And Moominpappa stands in his room which is equipped with maritime clutter, looking out of his window through his telescope. The small shy people are in tiny rooms in the basement." But Tove didn't build this wonderful house to put in a museum. She didn't build it to market her books, or as a wonderful photo opportunity for social media. This house is a labour of love, a work of art, an act of pure creation by someone who felt compelled to write, draw and make from an early age, and for whom imagined universes arrived so fully realised in her head, they could literally be translated into bricks and mortar. That house, along with so much else - like the sculptures and montages of scenes from the books they made together and put in glass cases - is for me a beautiful representation of why in some ways, Tove Jansson was the ultimate children's writer. She wasn't just a children's writer, of course, not by a long stretch - but she was one of the greatest artists to write children's books. In a famous 1961 essay, “The Deceitful Writer of Children’s Books”, Jansson writes that she writes for children not because she is particularly interested in them, or because she wants to entertain or educate them, but much more because she needs to satisfy "the childishness in herself". This is not emotional immaturity or arrested development, of course - but rather a profound connection as an adult with the intuitive world of childish make believe and play, and a sad awareness at its passing. Born into a somewhat madcap household of artists, from an early age Jansson was drawing, writing and making, at a dizzyingly prolific rate. It was like a compulsion, and I think any writer would - at certain times - envy that inexhaustible drive to produce and create. She developed her craft in all disciplines over many years, but in the 1970's, was able to sit down and build a toy house for her Moomins just as she might have done as a child at the beginning of the century. Moominland is the world through the eyes of a child, captured with the skill of an adult, a synthesis of pure-make believe and acute, uninhibited natural observation, a perfect marriage of pictures and words. And it is a world of mystery tinged with an ineluctable sadness. ‘I don’t know,’ Snufkin replied. 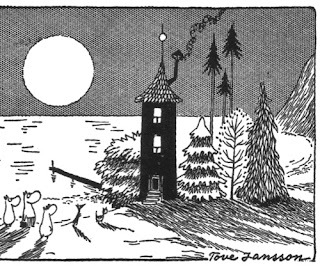 The genius of Jansson is her ability to take children so simply and so naturally on exciting night journeys down mysterious paths, never to deny the human impulse to grow and to wander - even if gallons of milk, berries and buns will always be waiting in a warm Moominhouse on your return. The elegant drawings and poetic prose of the Moomins tread the finest of paths between an enticing retreat of warmth, family eccentricity and humour - that we know cannot endure forever - and the mysterious unknowable forest beyond. It's a path every child must take one day, and who better to guide you down that road than a Moomin? Which other cast of creatures so gracefully demonstrate the wonder, mystery and sadness of growing up? If it is childish to memorialise childhood with such imagination and feeling, whether through a miniature blue house or the pages of a book, then let's always try and write for the childishness in ourselves. Lovely! I wish I could see that house! Such a beautiful post, Piers, especially about the link between writing for children and the child's playful state.! Thanks Sue and Penny. My cousin invited me to go to the centenary exhibition with her, so wish I could have gone. Oh, I love Tove Jansson and the Moomins. I actually first read the books as an adult, and love them for their descriptions of nature and landscape, and families. I like her short stories too - The Winter Book/The Summer Book. That house looks amazing. The amount of detail put into it is incredible. Fabulous post - thankyou, Piers! What a fantastic house! I was scared of the Moomins when I was a child but I think it is time to revisit them, especially as I have enjoyed other books by Tove Jansson. I never read these as a child but all my children have adored them... I would love to see that house! Thanks for a great post!